Because of all the negative comments I had heard about Scandinavian cities (cold, unpleasant, uninteresting, bla bla bla), my notions about them were far from the reality I encountered on a recent trip. As a Gaspesian with a warm and curious nature, I had always preferred Latin-American and European cities. When I was told “Paul, for our first issue we’d like an article about a Scandinavian city,” I said to myself, “Okay, it’s now or never. Let’s go.” Luckily, I have friends living in Copenhagen who were only too happy to sell me on the splendours of their city, and they didn’t have to try very hard! The warmth, good manners, and openness of the Danish people charmed me right from the start. The result – I am completely in love with this charming, classic, discrete, modern, and authentic city! I was there for only four cloudy, rainy, humid days in early March, so I saw only a few hours of sunlight at the most – just enough time to take some snapshots. 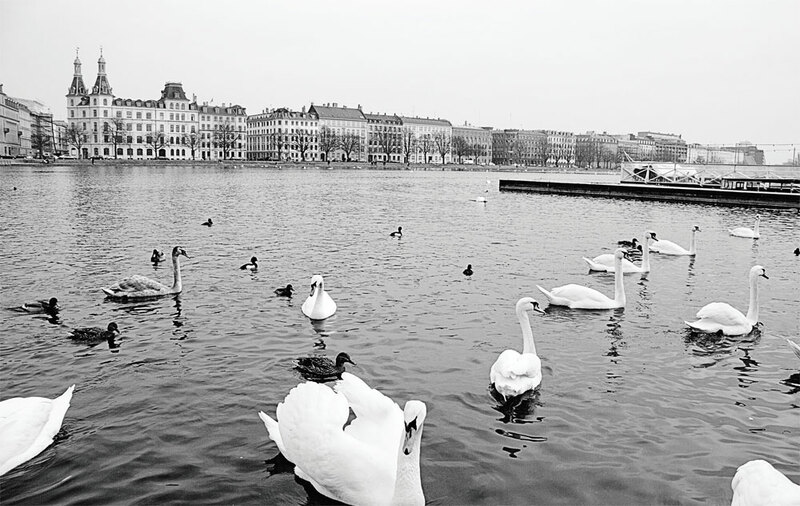 Nevertheless, I have added Copenhagen to my list of cities where I’d like to live one day. 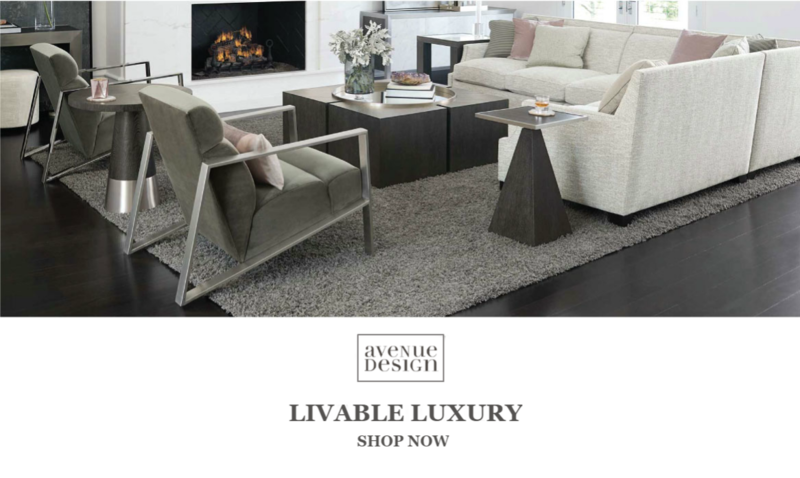 Welcome to the city of Arne Jacobsen, Lars von Trier, and Bang & Olufsen. Welcome to the city where the people are happy and know how to stop and smell the roses. Welcome to Copenhagen ! Roaming the streets and bridges of the downtown area is the perfect way to admire the buildings, breathe the salty air, and watch all the happy, smiling cyclists making their way around town. 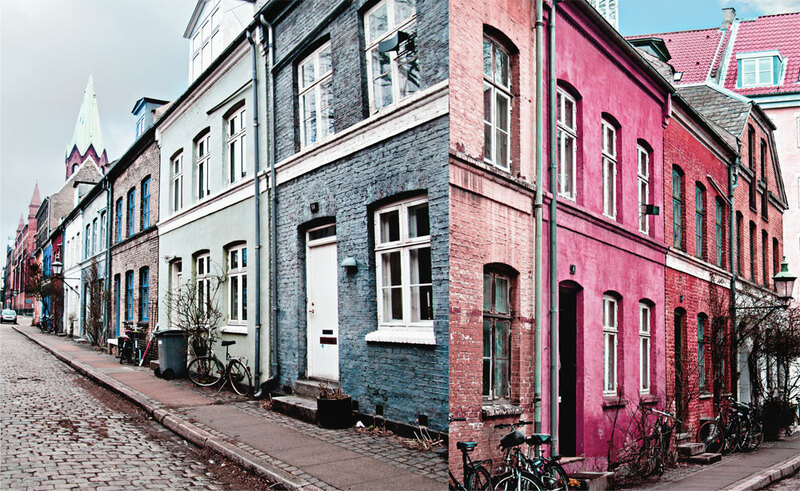 You will be enchanted by the beautiful, colourful architecture that falls somewhere between Nordic and classical, and everything is so clean! 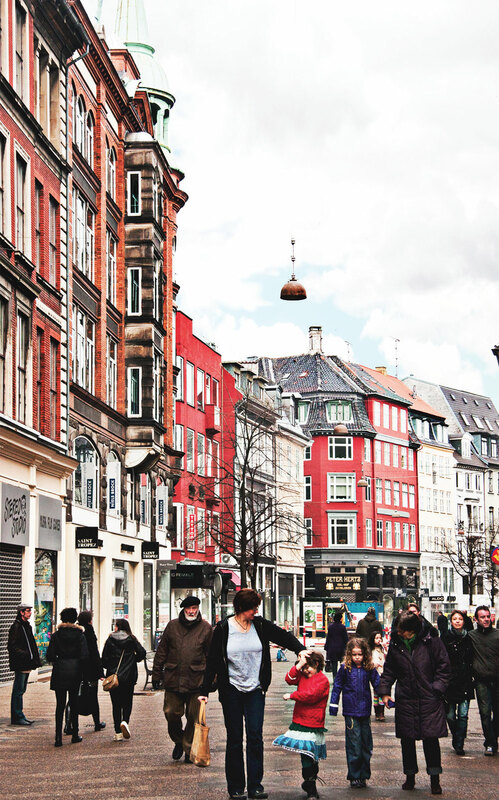 Take a pleasant stroll on Strøget Street, the world’s longest pedestrian walkway and Copenhagen’s largest shopping area, where you’ll find the big names in fashion and design, as well as many squares, cafés, and terraces. Important note: Businesses in Copenhagen all but close on the weekend. Stores close at noon on Saturdays (except for two Saturdays each month when they stay open until 5 p.m.) and are closed on Sundays. In Denmark, weekends are devoted to time with family and friends. How wonderful! Nyhavn which means new port, is a popular area for tourists. Though not particularly drawn to such places myself, I recommend a visit there. 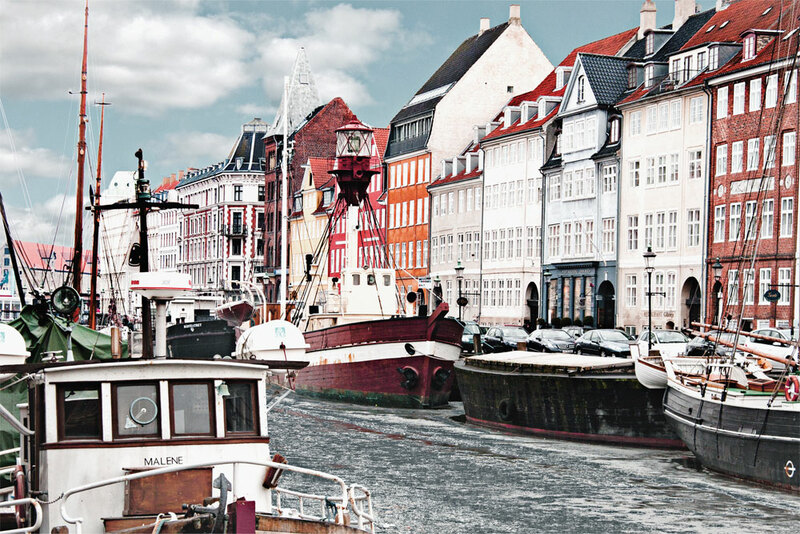 It is essential for understanding Copenhagen’s origins and its link to the sea. I suggest visiting in the late afternoon, when the light and the atmosphere are at their best. Sit on a terrace, order a coffee, a glass of wine, or a scotch, and enjoy a simple, one of a kind moment. First hotel Skt. Petri: Located in the centre of town in an old warehouse, a few blocks from Strøget Street, it’s a chic, fashionable, and unpretentious hotel. Did we mention that it’s a favourite with such artists as Lady Gaga, actress Kirsten Dunst, and film director David Lynch. Krystalgade 22,, firsthotels.com 45 33 45 9100. K Bar: This quiet, inviting little bar in the centre of town is a great place to kick off an intoxicating evening. Ask for recommendations from the charming and very professional owner, Kirsten Holm, a true pro who enjoys an unequalled reputation. I fell in love with this place and strongly suggest that you visit. Their dirty martinis are excellent and so is the ambiance. Ved Stranden 20, k-bar.dk 45 33 91 92 22. Umami: Also located in the centre of town, this Japanese restaurant with a Danish touch is simply excellent, with an exacting service that one would expect in the finest restaurants. Try the scallop and fois gras sushi – it’s simply divine! Highly recommended, but a bit pricey for most: count on a bill of $75 for two people (with sake and wine). Store Kongensgade 59,, restaurantumami.dk 45 33 38 75 00. Nouvel: A typical, bustling little restaurant that serves French cuisine with a Danish twist, Nouvel’s clientele is cheerful, eclectic, and chic, yet unpretentious. Gammel Strand 34,, restaurant.nouvel.dk 45 33 32 04 00.